Commissioning an artist to paint a portrait is a once-in-a-lifetime undertaking for most people, if they’re lucky enough to have the means to do so. Today many more people enter this exciting venture than in the past, since the internet has made hundreds, if not thousands, of choices in portraiture available. Some of those portraits are offered by serious, professional fine art portrait artists; others come from mass production workshops in China and other overseas countries, and sometimes similar outfits in the U.S. which employ teams to turn out work. Let’s say you’ve decided not to go with the cheapest portrait you can find, but with an individual American artist. That narrows down your selection a little, but you will still find yourself with a vast array of options. How do you know what to look for, and whether you’ll be satisfied in the end, and feel you’ve gotten your money’s worth? One of the first things you will notice when you’ve begun your search, is that there is a very wide range of pricing in portraiture. Maybe that shouldn’t come as a surprise: after all, you can buy a brand new car for $10,000 or half a million, and it’s still a car. But remember what your parents always told you: You get what you pay for. Are you simply interested in having a favorite snapshot copied and converted into a painting? Or are you looking for a professional to take time to get to know the subject and create a work of fine art which will capture spirit and personality as well as an excellent likeness? Depending on your answers, you will want to call on very different artists. A look at the various sources I’ve placed in the Resource Book will provide ample contrast, and not just in the swing of prices. It is always best to go and look firsthand at actual portraits done by the artist or artists you’re considering. Having said that, this may be impractical if you don’t have a number of portrait painters in your area. Today most true professionals have websites with high resolution photographs of their work, many of which can be enlarged to show detail, usually of the facial features. This can suffice. However, you may still want to begin your search with artists in your city, your state, a neighboring state, or at least your region of the country. You (or your child or the subject of the portrait) may be needed for a photo shoot and/or a sitting or several sittings. Some artists will travel to wherever you are for this purpose, but it will cost you more for their added time and expense. If, on the other hand, you need a posthumous portrait, you want an artist who is entirely comfortable with working from existing photographs. If your budget enables you to order an oil portrait of over $10,000, you may be best off using the services of an agent. Normally an agent will not represent an artist whose fee isn’t at least this amount, since they need to earn a commission on the fee charged. A good portrait agent will listen closely to the style of portrait you have in mind, ask you numerous questions, and then give you several excellent and reputable portraitists to choose from. In some cases they may even be able to show you actual portrait samples, as well as on line or printed portfolio images . To get a good idea of the range of fees charged by professionally trained and well established portrait painters, do a number of online searches. One excellent website called A Stroke of Genius gives you over 100 artists, mostly in the United States, to choose from. It will even let you select the type of portrait work you want to view. 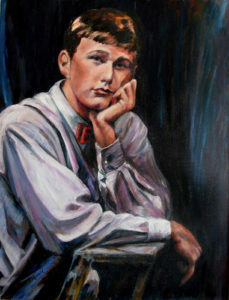 Examples of groupings include outdoor or indoor paintings of girls (or boys); family portraits; and formal corporate subjects such as judges, political figures, and university presidents. Fees for artists on this site range from about $2,000 up to over $25,000 for oil portraits, but charcoal, pastel and even watercolor portrait artists are also represented. What kind of a portrait are you looking for? It is important to have a feel for what you’d like the finished portrait to look like. Portraits can be extremely formal (think satin dresses, velvet drapes, oriental carpets and posed figures.) They can also be entirely informal (think beach, play clothes and subjects looking anywhere but into the camera lens.) Some artists specialize in one or the other, while other artists are more flexible. You should also know before approaching an artist whether you’re seeking a head and shoulders view of the subject, or subjects, a three-quarters view, or a full figure rendering, whether seated or standing. If you can’t decide, the artist can help you with this. What style of painting do you like? Another important point of consideration is the style of the artist. Do you prefer a highly detailed degree of realism in a portrait, or a more loosely-brushed or impressionistic rendering? Or one that uses color imaginatively? Do you want the background specific and detailed, or fading out of focus? Some portraits are done with shaded colors only as a backdrop, while others faithfully record every detail of an interior or outdoor scene. What should you ask the artists you contact? Once you have a list of several artists whose work you admire, and who also turn out the sort of portrait you’re interested in, you need to begin a dialogue with each. It is important to talk with the person who will create your portrait, to feel comfortable with him or her, and to know what guarantees there may be regarding the degree of input you will have as the person commissioning the portrait. Many artists are comfortable agreeing to work with you to make the finished product please you completely; others may insist on complete independence once you have selected them. For example, an artist may be willing to send you updates as the portrait progresses, and even show you a photograph of the work before it is entirely finished. Most are willing to make at least minor alterations to the painting if you are not satisfied with what you see. Keep in mind that the portraitist wants you to be thrilled with the painting so that you will recommend him or her to your friends. Word of mouth is extremely important in building an artist’s reputation. Will the portrait be in oil, pastel, or some other medium? Will it be painted from life, from photographs, or a combination of these? If photographs, will I supply these, or will the artist do a photo shoot? What size will the finished portrait be? If there is more than one subject (person or pet) in the painting, is there a discount for additional subjects? What are the artist’s fees and terms? Is the deposit refundable for any reason? Can I pay in as many installments as I wish? When can I expect work on the portrait to begin? Can I see a photograph of the work in progress or at least before delivery? What if I want changes made once I see the painting? What will I be charged if I want the artist to frame the piece? What will the estimated shipping, handling and insurance charges be? Or can it be delivered? All the initial work that you will put into finding the right artist for you and coming to terms on your portrait will be worth it in the end if you have chosen wisely. A portrait is a lifetime investment, and good ones become treasured family heirlooms. Portraits give more immediacy and a more lifelike presence than any photograph can, bringing loved ones closer. By commissioning a portrait you will be acquiring the most uniquely personalized piece of art, and giving yourself or your family, and later on your heirs, a priceless gift for the ages.